The primary focus of January's LWV-Princeton Area meeting was a discussion of the LWVUS program planning for the next biennium. Attendees reviewed all of the LWVUS program positions and agreed with the recommendation to continue emphasis on Making Democracy Work reforms, such as voting rights, improving elections, campaign finance, and redistricting. We did suggest, however, that the LWVUS examine the constitutionality of parts of the new tax code, such as allowing religious institutions to support candidates. We also asked that the LWVUS clarify under which position advocacy against sexual harrassment and discrimination in the workplace may be taken. -Participating on boards, such as Princeton Community Housing. Members should keep track of any advocacy they do in the future. We will devote a few minutes of the Annual Meeting to highlighting areas in which members could advocate on their own or in cooperation with other organizations. Click here for a complete January 2018 Meeting Report. Ellen Kemp assures us that we are fiscally sound; a copy of the January Treasurer's Report is available in the Members Only section of our website. Chrystal Schivell will be the point person for Callathon. 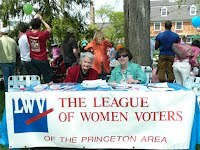 The LWV-Princeton Area will purchase an ad in support of the LWVNJ's fundraiser, Making Democracy Work: Awards Ceremony and Cocktail Reception. The Leadership Committee is exploring creating a Facebook page. Attendees at the January meeting approved the revised bylaws. Jennifer Howard will have a final copy sent to the membership at least one week before the Annual Meeting, at which a vote will be taken. January 20: Women's March in Morristown. Chrystal and Ellen plan to attend. One of the speakers will be LWVNJ President Nancy Hedinger. Details are posted on our website. April 17: Leadership Committee planning for next year: All members are welcome. Anyone interested in joining the Leadership Committee or the Nominating Committee for the 2018-2019 League fiscal year, please contact the Leadership Committee at lwvprinceton@gmail.com. May 14: Tentative date for Annual Dinner: Lee Forbes is taking charge. June 28-July 1: LWVUS Convention at the Hilton Chicago. Anyone eager to attend Convention as a delegate, please contact the Leadership committee at lwvprinceton@gmail.com. 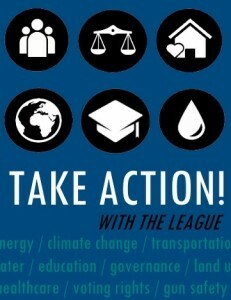 Reminders about upcoming events will continue to be sent by email, but everyone should go to the League website lwvprinceton.org and click on Subscribe to be sure of missing nothing.